Use this utility to update Person Photos to a specific size. This may reduce the overall size of your Arena database if your existing photos are a higher resolution than the size you specify. 1. From the Administration menu, select the Utilities option. 2. Click Resize Person Photos. 3. Choose the List People from the drop-down list that you would like to update. 4. 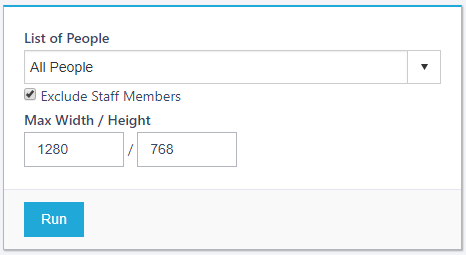 Click the check box to Exclude Staff Members. 5. Enter the Max Width / Height in pixels (e.g., 1280 / 768). The aspect ratio of the images will be retained. 6. Click Run to begin the process.